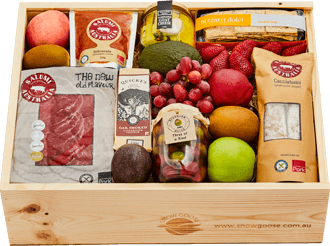 We’ve spent generations pursuing our mission to produce the finest fruit and deliver our unique rustic wooden boxes filled with the very best produce. 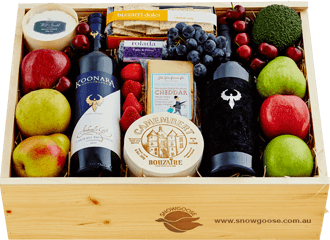 Welcome to the Snowgoose online gift hamper shop, home to the finest gourmet fruit gift hamper experiences. 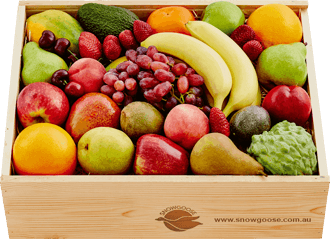 At Snowgoose, we believe in surprising, delighting and making someone feel special in an unforgettable way. Browse our online shop and you'll discover a gorgeous collection of unique fruit gift hamper ideas. Each one is specially curated to take your recipient's taste buds on delectable and extraordinary adventures. 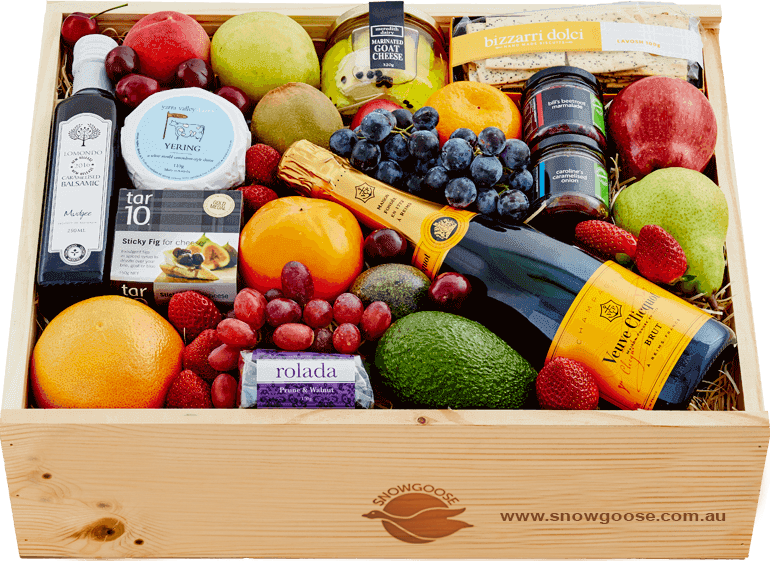 Snowgoose fruit gift baskets brim with the finest quality produce from Australia's top growers, artisans and small batch providores who live and breathe the art of taste. Hand-foraged or home-grown ingredients fuse with culinary expertise to produce undeniably delicious aromas, textures and flavours. 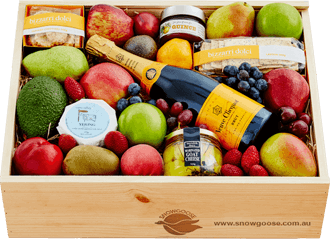 A true delight to give and an extraordinary experience to receive, our unique fruit hampers give the rare gift helping people to slow down, relax and indulge in life's simple luxuries. 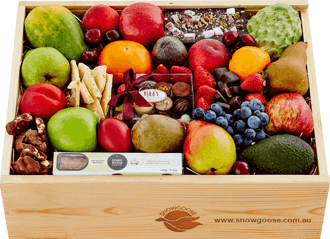 Handmade to order, Snowgoose fruit gift baskets arrive exquisitely presented in our famous wooden box, bearing the Snowgoose marque of authenticity. We guarantee your thoughtfulness stands out with a gift that makes them feel truly cherished. 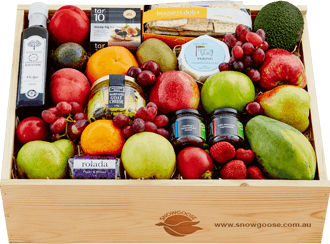 Our incredible online range of fruit gift baskets and hampers showcase our passion and obsession for uncovering Australia's most delicious best-kept secrets. 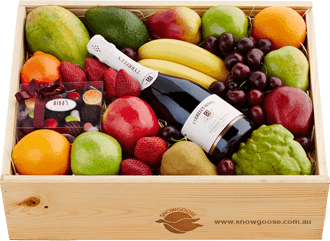 Quick and easy to order, and unbelievably appreciated, our luxurious fruit box gifts are perfect for celebrating or commemorating important events. 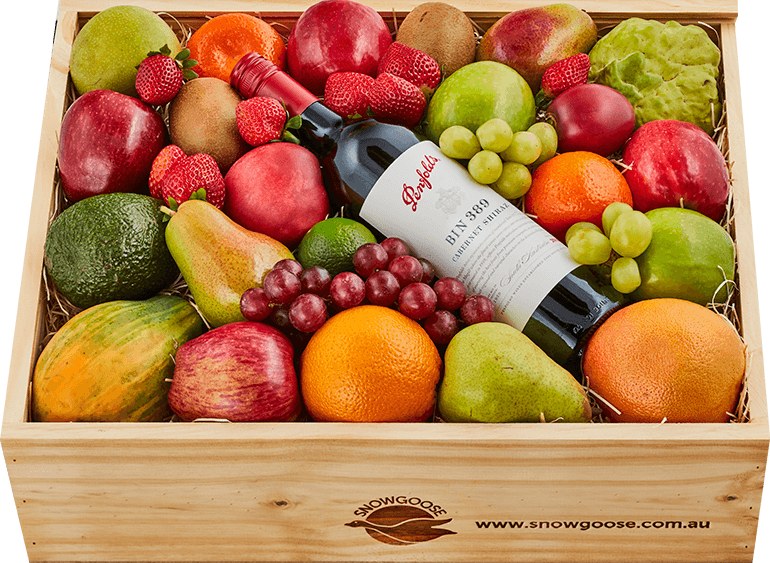 Our gift hamper delivery services locations across Australia including same day delivery* to Sydney metro areas and standard delivery to Melbourne, Brisbane, Perth and Adelaide. Explore our hamper shop and discover delectably different ideas for birthdays, anniversaries, Christmas and thank you gifts. 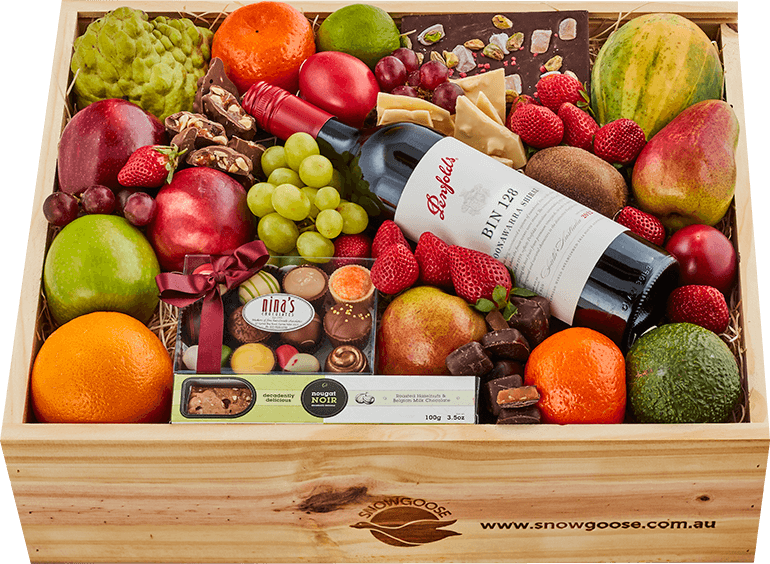 You can wish someone better with our healthy get well fruit basket, send a thoughtful condolence fruit box, or treat the man in your life with our new Bourbon gift hamper for men. 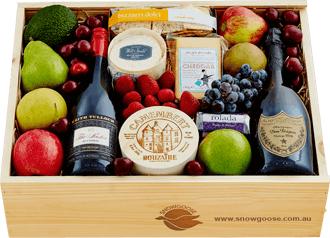 Our latest Corporate Fruit Gift Hamper Collection features indulgent sweet and savoury Gourmet Gifts of Taste for every occasion, including our highly coveted Grand Reserve Hamper for deserving VIPs. 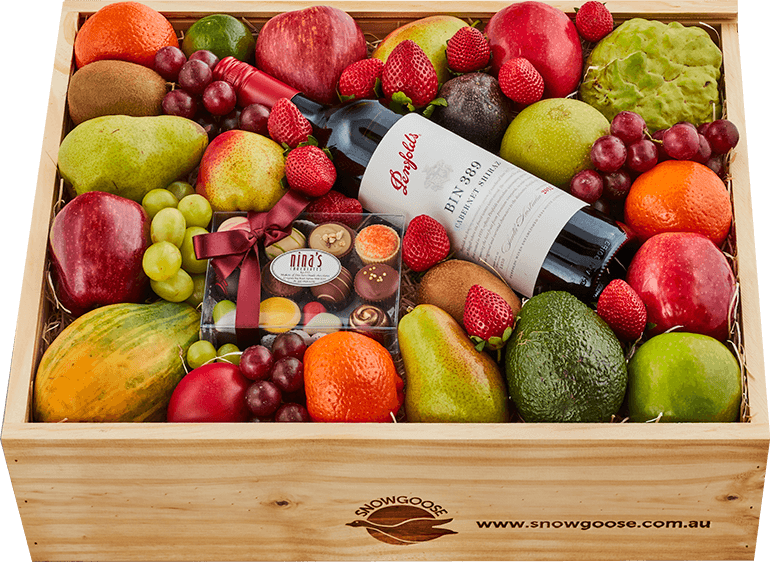 We hope you enjoy browsing and sending your online fruit gift hampers as much as we enjoy hand making them for your recipient to savour. Thank you so much for choosing Snowgoose.